Product #21430 | SKU 9310 | 0.0 (no ratings yet) Thanks for your rating! The MOTU 8M - Thunderbolt and USB Audio Interface With AVB Networking and DSP (24x26, 8 Mic/Line/Instrument) is designed for studio recording, installed sound, and live sound reinforcement applications such as mixing a band in a club or music venue. 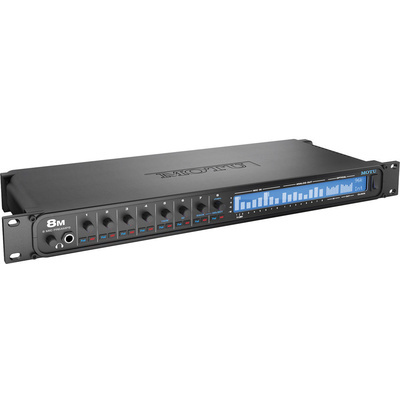 The 1U 19" rackmountable device features eight balanced combination microphone/line/instrument inputs with individually switchable +48V phantom power and pads, v-limiting circuitry to prevent clipping, 8 analog outs, one front panel stereo headphone output with gain control, 2 x 8-channel ADAT optical, and RCA S/PDIF (with sample rate conversion). Additional I/O can be added to the system through AVB networking. The system can be further expanded through connection to a MOTU AVB Switch (sold separately), for five total devices and the capacity to stream over 512 channels on the network. Sixteen 8-channel network streams may broadcasted while simultaneously listening to sixteen 8-channel network streams. The AVB network provides its own network-wide time base for phase locking all connected devices and also allows one of the connected devices to be assigned as the master clock. An added benefit of the AVB network standard is the automatic device discovery for self-configuration, 100 meter cable runs, as well as the system's Stream Reservation Protocol which provides guaranteed Quality of Service (QoS) and an uninterrupted point-to-point network connection.